A rally was held last week at Melbourne’s Federation Square demonstrating for action against the persecution of Iraq and Syria’s Christian minority. Around 3,000 people took to the rally, which was a means of pressurising state and federal parliaments into taking unequivocal action against the plight of Christians facing endless persecution at the hands of the Islamic State (IS) (also known as the Islamic State of Iraq and Syria (ISIS)). One of the suggested means is to open immigration borders and allow those persecuted to seek refuge in Australia. Dean Kalimniou, a Panepirotic Federation of Australia spokesperson, said that Greeks and Iraqi Christians, for the most part Assyrians, have shared a rich history spanning over thousands of years, and that connection remains strong. “There are many Assyrians who lived in Greece and who migrated to Australia and speak Greek and they are integrated within the Greek community, so those contacts are there,” Kalimniou says. 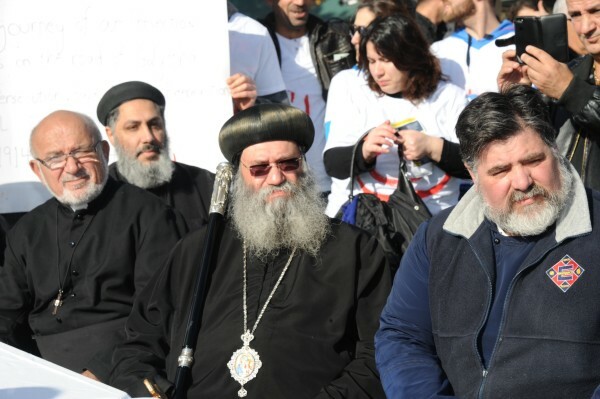 Those present at the rally included Victorian Coalition MP Bernie Finn, Victorian Shadow Parliamentary Secretary for Scrutiny of Government Frank McGuire, Bishop Suriel of the Coptic Orthodox Church and Father Emmanuel Lykopantis of the Greek Orthodox Church. Mr Kalimniou said that the historical and cultural connections between the Assyrian and Greek communities is one that builds on the fabric of multiculturalism, shared experiences “and providing solidarity when that’s required”. “If you notice some of the Greeks that were there, like the Pontian group, they feel very strongly about this issue because they’re united with the Assyrian community in campaigning for the recognition of the genocide (of Greeks, Assyrians and Armenians by the Ottoman Turks). Mr Kalimniou believes that further rallies are needed to put greater pressure on governments, both in Australia and internationally, as the plight of Iraqi Christians worsens. He also noted that the Islamic State is also persecuting moderate Muslims. Father Lykopantis, who represented the Victorian Greek Orthodox Church, held similar views to Mr Kalminiou and told Neos Kosmos that Australian governments, at state and federal levels, needed to do more for Iraqi Christians. “They (Assyrians) were very appreciative that we as a church were there to show support on their behalf. It’s very hard because this is a conflict where people are fighting with guns and to be quite honest there’s not really much that we can do, we can only put pressure on politicians and say ‘look, you have to somehow intervene in this matter and bring a result to it’,” Fr Lykopantis says. He said that the Greek Orthodox Church, in conjunction with the Victorian Council of Churches, a conglomerate of Christian churches in Victoria, continues to support causes that are non-Greek in nature, but serve a distinct purpose for the general wellbeing of the greater community, and this was no exception. “The other thing that we’re actually doing as a whole group of Christian churches is we’re trying to get a response from the Islamic Council to see where they stand with these groups, because this ISIS group is also killing moderate Muslims as well. But the Islamic Council is yet to respond. He said that whilst the Greek Orthodox Church in Australia, with reference to Victoria, is very restricted in a political and legal sense, the Church of Greece, with the help of the Greek government, is doing all it can to help persecuted Christians. He said that he and the church would continue to pray for the plight of Iraqi Christians as well as for the sanity of the rebels who are persecuting innocents.